Tennessee’s NCAA Tournament history goes something like this: after the field was expanded to 64 teams in 1985, the Vols didn’t make the Sweet 16 until 2000. With the turn of the century came better basketball: Tennessee played its way to the second weekend in 2000, 2007, 2008, 2010, and 2014. 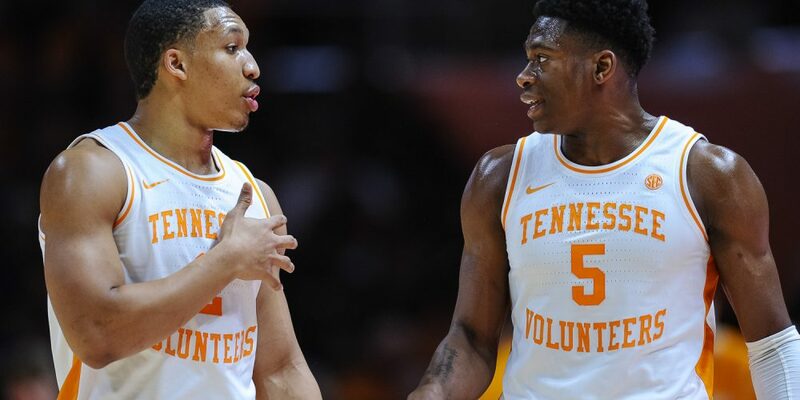 The Vols can make it six times in the last 20 years with wins on Friday and Sunday; that math sends every senior to the Sweet 16 at least once on average. Three other times since 1985, the Vols lost in the second round despite receiving a seed projected to make it to the second weekend: 1999 (No. 4), 2006 (No. 2), and last season (No. 3). Of course, only the 2010 squad made it through to the Elite Eight, and almost made it to the Final Four. Making it to a regional final thus becomes a clear indicator of an all-time season at Tennessee, no matter what preceded it. In this year’s case, better basketball but no hardware came before a chance to play through the geographically-friendly confines of the South region as its No. 2 seed. In Knoxville, winning two games puts you on a great list. Winning three puts you atop it. And we’ll hang your own banner for winning four; two of them if you win six. It all starts today, though thankfully Tennessee starts tomorrow, which gives us 16 games before we become emotionally compromised, no matter what happens to your bracket. Tennessee’s past history and present seed point to the Elite Eight as a reasonable goal; the team atop the region being number one in KenPom by a healthy margin also presents one scenario where you just get beat by a better team at region’s end. Anything can happen between now and then. And make no mistake: this Tennessee team is definitely good enough to envision another scenario where it wins the whole Fulmerized thing. For now, let’s take a look at Tennessee’s path to the Elite Eight in comparison to its predecessors who were seeded high enough to get there. Last year stands out because of the chaos that happened in Tennessee’s region: KenPom No. 1 Virginia down to a No. 16 seed in round one, KenPom No. 4 Cincinnati down to Nevada in round two. The Vols at No. 3 fell to Sister Jean in round two. But that path wasn’t looking easy at all when the tournament began. It’s always going to be harder to make the case for an Elite Eight from a No. 3 seed. Let’s look instead at Tennessee’s other two No. 2 seeds. The 2008 Vols handled American 72-57 behind four threes from JaJuan Smith. This year, Colgate checks in at 127th in KenPom, the highest of the No. 15 seeds (Montana 137, Abilene Christian 146, Bradley 161) but nothing as scary as Winthrop on paper. KenPom likes the Vols by 15 points. Before Wichita was Wichita, they were a No. 7 seed that hadn’t won an NCAA Tournament game since 1981. They won two by beating the Vols in the second round in 2006, turning back a five-point Tennessee lead with under six minutes to play. Mark Turgeon left for the Texas A&M job the following year, leading to Gregg Marshall’s arrival. On that day in Greensboro, the Shockers hit 50% from the floor and 9-of-16 60% from the arc; that’ll get you beat. The real seeding travesty was 2008. Butler was 29-3 on Selection Sunday and ranked 11th in the AP poll, but was given a No. 7 seed opposite the Vols. This was Brad Stevens’ first year as head coach, and they almost pulled it off: Tennessee won 76-71 in overtime, closing the game on a 10-3 run. This year Cincinnati presents a challenge in geography. But if you remove that from the equation and I asked who you wanted to play in the second round among No. 7 seeds Louisville (17th KenPom), Wofford (21st), Nevada (25th), and Cincinnati (32nd)? You’d probably agree with Mr. Pomeroy. Iowa is the second-highest No. 10 seed in KenPom, but behind the Gators, who couldn’t be matched up with Tennessee in the second round. The geography is good for Tennessee in general, bad for Cincinnati specifically, but the potential second round opponents are about what you’d expect from a 7/10 match-up. And the Vols avoided getting into it with an under-seeded mid-major for the second year in a row. Speaking of under-seeded mid-majors, George Mason would’ve been the foe had the Vols closed against Wichita in 2006. They ultimately went through No. 1 seed UConn to get to the Final Four. Tennessee’s seeding in 2008 is, again, well-discussed at this point. The Cardinals were a bad match-up, though in KenPom all the No. 3 seeds were bunched together that year. There was no easy road through Charlotte anyway: No. 1 North Carolina was waiting in the Elite Eight. 2008 remains the only year all four No. 1 seeds advanced to the Final Four. This year, in KenPom, Purdue and Texas Tech are 9th and 10th, the class of the No. 3 seeds. Houston, a big winner in NET, is 15th; LSU is 18th, but probably not an option for the Vols with both coming from the SEC. Further down the list, Villanova is 26th in KenPom, but they get no prize right away: St. Mary’s is 30th, easily the highest-rated No. 11 seed (Ohio State is second at 44th). A date with Purdue in Louisville would be lots of fun; the Boilermakers are a shade closer to the arena than the Volunteers. And, again, I think it’s what you have to expect in a 2/3 Sweet 16 match-up, if we get it: both teams are really good. You can nitpick a couple of things as always, but I think this bracket is reasonable. We can worry about Virginia if/when we both get there, but Tennessee’s road to the program’s second ever Elite Eight is one this team is capable of handling.